"We often picture the Earth's mantle as a liquid that flows but it isn't—it's a solid that moves very slowly over time. Traditionally, it's been thought that the flow of rock in Earth's lower mantle is sluggish until you hit the planet's core, with most dynamic action happening in the upper mantle which only goes to a depth of 660 km. We've shown this isn't the case after all in large regions deep beneath the South Pacific Rim and South America," explained lead author, Dr. Ana Ferreira (UCL Earth Sciences and Universidade de Lisboa). "Here, the same mechanism we see causing movement and deformation in the hot, pressurised rock in the upper mantle is also occurring in the lower mantle. If this increased activity is happening uniformly over the globe, Earth could be cooling more rapidly than we previously thought", added Dr. Manuele Faccenda, Universita di Padova. The study, published today in Nature Geoscience by researchers from UCL, Universidade de Lisboa, Universita di Padova, Kangwon National University and Tel Aviv University, provides evidence of dynamic movement in the Earth's lower mantle where ancient ocean floors are plunging towards the planet's core, crossing from the upper mantle (up to ~660 km below the crust) to the lower mantle (~660—1,200 km deep). "In a CAT scan, narrow beams of X-rays pass through the body to detectors opposite the source, building an image. 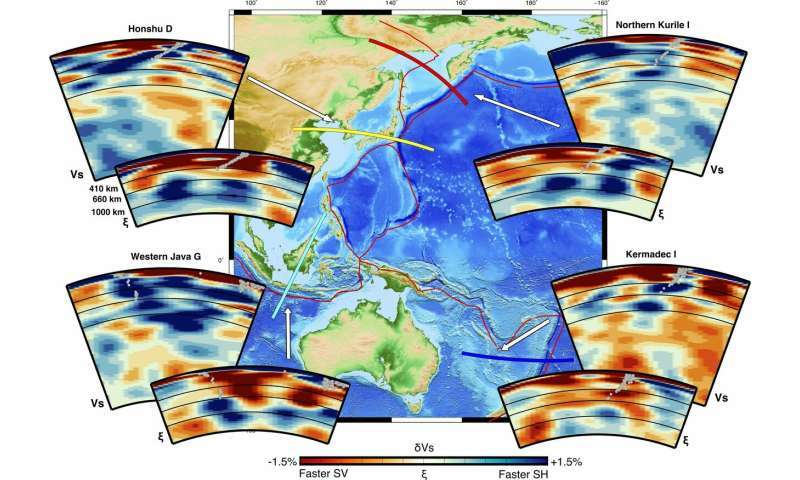 Seismic waves pass through the Earth in much the same way and are detected by seismic stations on the opposite side of the planet to the earthquake epicentre, allowing us to build a picture of the structure of Earth's interior," explained Dr. Sung-Joon Chang, Kangwon National University. "How mantle flows on Earth might control why there is life on our planet but not on other planets, such as Venus, which has a similar size and location in the solar system to Earth, but likely has a very different style of mantle flow. We can understand a lot about other planets from revealing the secrets of our own," concluded Dr. Ferreira. "... ancient ocean floors are plunging towards Earth's core over millions of years." An entirely new meaning for "plunging"!